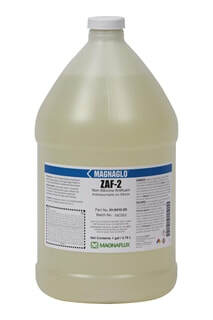 ZAF-2 is an excellent general-purpose defoaming additive to eliminate and prevent foaming in water-based magnetic particle suspensions, aqueous penetrant developer baths, hydrophilic penetrant remover baths and aqueous cleaning solutions. A few drops of ZAF-2 are enough to eliminate foaming in most water-based solutions. ZAF-2 can be sprinkled onto the surfaces of baths to eliminate foaming. It is not intended to remove fine lather which may occur in recirculating baths where there is excessive air intake in the recirculation pump.